Summertime sees tennis fever grip the nation and it’s not unusual to see more tennis players at the clinic suffering pain! Tennis is a great game but can be physically demanding. Typical tennis injuries that I see my patients with, are so often associated with not preparing properly before playing a game. 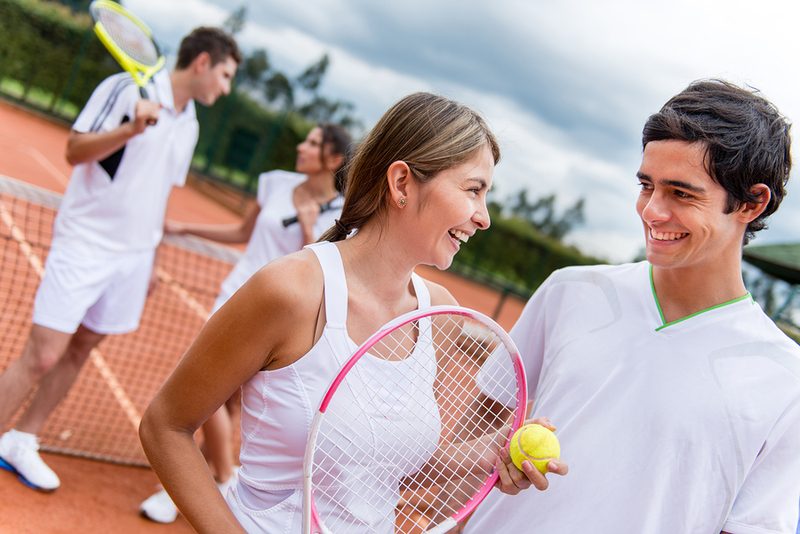 So, if you are thinking of picking up a racket for the first time, or are a seasoned tennis player struggling with aches and pains that are hampering your play, here are a few helpful tips to help you stay sports injury free. Cardiovascular Fitness – interval training of high and low speeds will improve your CV fitness. Ideally running, but cross trainer, bike or rowing machine will also help better prepare your body for the potential strains of the game. Jump Skills – or Plyometric training will help condition your body to sudden , high impact movements . Eg ,squat jumps, side jumps. Muscle strengthening – using resistance such as hand weights, kettle bell or resistance bands whilst performing standing lunges, squats and side steps will strengthen the whole body. Don’t forget to engage your tummy muscles to strengthen your core and protect your back. Flexibility – a regular stretching routine, paying particular attention to the hips, calves and trunk rotators, will reduce the risk of injury when you stretch of twist for a ball. Ideally aim to do this twice a week. Ideally, try to include some or all these components into your weekly routine. Practiced regularly, they will make a difference to improving your physical fitness and strength when you are running around the court. Should you notice any aches, pains or weak spots, then please don’t risk getting a full blown sports injury. As a physiotherapist, I treat many sports injuries and the old adage ‘prevention is easier than cure’ couldn’t be truer. All year training – if you are a fair weather tennis player, do consider finding an activity you can do all year round to keep conditioned such as Pilates, yoga, swimming, or aerobics. Most of all, enjoy your tennis! And should you suffer any annoying aches and pains, then just come and get yourself checked out. Our physiotherapy and sports injury team are happy to help. Telephone 020 8943 2424 for an appointment.